Rotterdam has a new icon: Markthal Rotterdam. At a historical location at the Binnenrotte, next to Blaak Station and the largest weekly open air fresh food and hardware market in Rotterdam, the first covered market of the Netherlands was realised. Markthal includes a huge market floor on the ground floor under an arch of apartments. 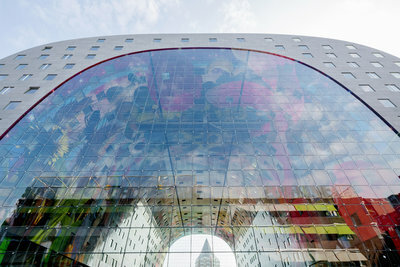 Its shape, its colourful interior and the height turns Markthal into an unique spectacle. Unique is not only its shape and size, but especially the way the different functions are combined. The combination of an apartment building covering a fresh food market with food shops, restaurants, a supermarket and an underground parking is found nowhere else in the world. Markthal was a success already before being realised: it is a new and fresh icon which already has attracted large quantities of international press and visitors. The centrally located building is rooted in the city’s history, located parallel to the late medieval ‘Laurenskerk’ (Laurens church) and at the location of the former dike along the river Rotte. This river was diverted at the end of the 19th century in favour of a train line viaduct leading to the south bank of the river Maas. In the 1990’s this trajectory was rebuilt as an underground tunnel and the current oblong square emerged which offers room for the open air fresh food market twice a week. The 1950’s buildings on either side of the old highline suddenly faced the new square with their backsides and have been replaced ever since. Markthal means an important impulse to its surrounding area which is a strong contribution to the urban economy. Markthal with its daily fresh food market, shops and apartments, creates coherence and connections in the neighbourhood which will reach a new centrality. After completion of Markthal, the city of Rotterdam will start to refurbish Binnenrotte Square to make it more attractive also on days that there is no outdoor market. After the refurbishment the outdoor market will be reconfigured, the market lanes will connect seamlessly to the entrances of Markthal, to allow the public to easily enter and exit the building and to create incentives between the two markets, indoor and outdoor. The building is a new statement in the urban structure of Rotterdam with its high diversity of icons from the days of reconstruction and urban renewal, but also some new buildings that have been realised over the last years. It is in line with the city’s ambition to house more people in the centre and to raise the life quality in post-industrial Rotterdam through a series of large scale projects and countless bottom-up projects. The combination of styles of architecture forms an excellent environment for the spectacular design of Markthal. Markthal is accessible by all means of transport. Blaak train station is right in front of the building and serves also as metro, bus and tram hub. In 2015 the city of Rotterdam will construct a recessed bicycle parking right next to Markthal with space for 800 bikes. Next to this excellent accessibility by public transport Markthal is also easy accessible by car. The four underground parking levels offer 1.200 parking places. As part of the general transformation of the ‘Laurenskwartier’ (Laurens quarter) neighbourhood these parking places are not only available to inhabitants but also open to visitors of Markthal, the library, the outside market and tourist attractions in the area. A new traffic plan in the vicinity of the car park entrance will avoid queues, Markthal parking will be open 24/7. The 1.200 parking places are an important addition to the capacity of ‘Laurenskwartier’ (Laurens quarter) neighbourhood and part of the urban transformation. The underground car park is open 24/7 and equipped with latest technology such as a parking guidance system, licence plate recognition, online reservation system and charging points for electric vehicles. Visitors of Markthal, the library, the outdoor market or the city of Rotterdam can park here - as well as the inhabitants of Markthal. These innovative technologies are geared towards a more sustainable parking: the sophisticated parking guidance system and the license plate recognition help avoid unnecessary driving inside the garage whilst the online booking system is a customer service intervention avoiding traffic in the neighbourhood. ‘De Tijdtrap’ is a lasting memoir of the archaeological research conducted at the Markthal site. It presents the history of Rotterdam in a vertical exhibition alongside the escalator in the centre of Markthal which connects the hall to the four underground levels. The deeper the escalator goes, the more in depth the history of Rotterdam is presented in a number of displays with findings and models, accompanied by sound and images. Together they tell the story of the beginning of Rotterdam and its history of food. In October 2004 the team of Provast developers and architecture studio MVRDV won a competition organised by the city of Rotterdam for the design and construction of a market hall at Binnenrotte. The municipality wanted to extend the existing open air market with a covered addition. According to stricter European rules in the future the open air sale of fresh and chilled food would not be permitted anymore. Next to this the municipality wanted to augment the amount of inhabitants in the city centre in order to create more capacity for the services in the area. The demanded programme – housing, parking and a market hall – asked for an obvious solution: two residential slabs with an economically constructible market hall in between. Provast and MVRDV had seen in the South of Europe that these kind of market halls are often dark, introverted buildings with little connection to the surrounding urban area. The Markthal in Rotterdam however was to be an important impulse in the development of the ‘Laurenskwartier’ (Laurens quarter) neighbourhood and had to strengthen the Eastern side of the city centre. A highly public, open building with good accessibility was needed. The team decided to just flip the two slabs and market which led to a larger hall with two wide openings towards the city. In order to make the construction more efficient a curve was chosen that fitted a traditional elevator core. By adding some space to the lower floors for extra retail space the current volume of the arch emerged 120 meters long, 70 meters wide and 40 meters tall. The building needed to be as open as possible to attract the public and at the same time it had to be closed off due to weather conditions. Keeping the closure as transparent as possible a cable net façade was chosen which needs very few constructive elements. Its principle is comparable to a tennis racket in which the steel cable are used as strings in between which the glass is mounted. This cable net façade is the largest of its kind in Europe. Because of this miracle of engineering the art piece inside is visible from the outside, its lush shapes and colours invite the public to enter the building. The exterior of the Markthal is executed in grey natural stone, the same as on the pavements, to put the emphasis onto the interior. Markthal is a building without a backside. All sides of the building are accessible or shop windows. The entire supply for the hall, the shops and restaurants is therefore located underground. The first basement floor features an expedition court to which the delivery can happen with vans, from this exhibition court freight elevators reach the market hall. In this way inhabitants are not hindered by distribution activities that often occur in the early hours of the morning. Also in the basement is an Albert Heijn supermarket, Etos and Gall & Gall. The delivery for these stores is organised through an underground tunnel leading to hidden elevators at Binnenrotte square, in this way larger lorries can operate in distance to the hall. Inhabitants have storage rooms and shared bicycle rooms in the basement. Construction was started October 1st 2009 by contractor combination Mobilis and Martens en Van Oord. Before this the school and parking garage which occupied the site before had been demolished. The school was relocated by Provast into a 1960’s office building right next to Markthal. On its roof is the school playground, kids have fantastic views into the length of Markthal. One of the many specialties during Markthal’s construction was the great depth of the construction site, 15 meters. Groundwater ran already at a depth of 3 meters below street level. As the cofferdam was not supposed to float up during construction the concrete piles were used in this phase as tension piles to keep the site stable. On July, 1 2010 the pile works were completed and a concrete grid was constructed: this was at the same time the future floor structure of the first basement and a protection for the construction site, a smart combination. In summer 2011 the divers started to lay the reinforcements for the concrete floor 15 meters under water, this was done in heavy duty diving suits, on touch, without any view in the murky water. The concreting took 72 hours. Day and night a 1,5 meter thick layer of underwater concrete was laid, 1500 lorry loads. December 2011 the site was slowly pumped dry, the floor which had to carry a weight of 12.000 kilo per m² appeared watertight. From this moment on, the site was dry and it took another year to complete the underground car park. Then the specialist work was done and contractors changed. 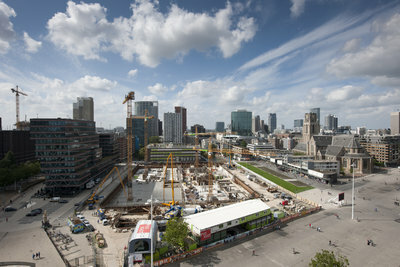 Construction company J.P. van Eesteren started on 1st of October 2012 with the construction of the arch. The construction of the two sides was done fast and economical by means of tunnel shuttering, which worked from the second to the tenth floor. The roof of the arch was realised in four parts supported by a temporary driving construction underneath, a so called Super Support Construction (in Dutch SOC). Inside the concrete, small Wi-Fi-devices indicated whether the concrete was hardening according to plan. The design vision of MVRDV describes Markthal as urbanism, the function mix is an integrated design, a 24 hour building which is a public and lasting addition to the city of Rotterdam. The interior of the arch is covered by the gigantic art piece Horn of Plenty, a multi-coloured creation by Rotterdam artists Arno Coenen and Iris Roskam. The art piece is made with Pixar Animation software depicting a photographic 3D illusion of fresh products such as fruit, fish, bread, flowers and also the tower of adjacent ‘Laurenskerk’ (Laurens church). Horn of Plenty refers to the great still-lives of the Dutch golden century, to the Greek mythology in which Cornucopia is a legendary object and to the tradition of artistic arch decoration known from places such as the Sistine Chapel. The artwork evokes the illusion of laying on your back in a meadow, looking up, right through Markthal towards the sky. The sun in the centre figures as Horn of Plenty from which the fresh produce falls down to earth. Horn of Plenty is one of the largest art pieces of the Netherlands. Its technology is unique, the fresh produce seems photographed but is built in the computer, piece by piece. The 3D impression is detailed in the same resolution suitable for a glossy magazine. In total the image consist of 400.000 megapixels. 1.470 gigabyte have been sent to the printer, in parts, as one computer could never open such a large file. The 11.000 m² art work have been screwed against the wooden interior facade of the hall in which must have been the largest puzzle of Europe. Each of the 4.500 aluminium panels sized 1,52 cm by 1,52 cm needed to be mounted in the right way at the right spot. The 2 mm thick panels are perforated in order to absorb noise from the hall, this helps to create the excellent acoustic profile of the halls interior. One piece in the centre of the art work is left white; here throughout the entire year an animation will be projected in the evening, this ‘video-mapping’ will change and respond to themes such as season and food. Variety and diversity is key for the market. The market stalls inside the hall and the surrounding restaurants and food stores offer a large variety of kitchens, styles, produce and price levels. The market floor itself has 96 fresh units. The units are arranged back to back and have an average surface of 20 m² and an average front of 9 meters. The units could be rented per piece or per series. Storage rooms, cooling units and preparation rooms for the units are located on the -1 level. Some units have a glass roof, others have a roof terrace, especially shops with a restaurant or catering service have rented these units and offer their clients the chance to eat and drink with a great view of Markthal. Roofs of other units will be used for urban farming, for growing herbs or vegetables which is not only pretty but useful, the plants have an acoustic function. A number of units is reserved for pop-up functions and will be used for seasonal products, for example asparagus or herring. On the ground floor and the first floor are about 20 shops and restaurants. All shops are related to food. On level -1 a large anchor store is located, Dutch supermarket Albert Heijn offers consumers the possibility to do all shopping underneath one roof. The fresh market is open daily. Monday till Saturday from 10:00h and 20:00h (late opening until 21:00h) and Sunday from 12:00h and 18:00h. The restaurants are open longer and all have direct street access. The edutainment centre ‘De Wereld van Smaak’ gives meaning to food, a story to fresh produce and room for discoveries, experiences and education. The latest trends and developments in food are given a stage. Producers have the chance to get feedback from consumers. ‘De Wereld van Smaak’ is a space that can be adjusted into a living lab, cooking school, presentation room or stage. The multifunctional space will be a meeting place for chefs, hobby chefs, dieticians, kids, senior citizens, passers-by and the entire food business. ‘De Wereld van Smaak’ is an independent cooperative in which a number of commercial parties take part. It inspires and stimulates everyone to make an educated choice for fresh food. It is an interactive platform offering space to all fresh food sectors such as vegetable and food, meat, fish, bread, pastry, dairy, herbs and spices and all related business. They will share their knowledge with each other and the visitors. 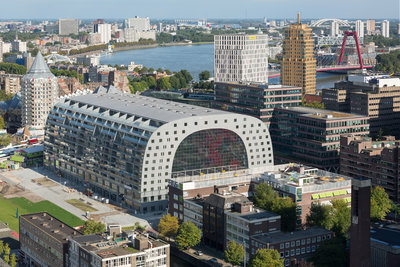 The horse shoe shaped arch of Markthal consists of housing from the third to the eleventh floor, in total 102 rental apartments and 126 apartments for sale. Each apartment has an outside terrace over the full width of the unit and the 24 penthouses on the top floor have – thanks to the arch shape – a very wide roof terrace. The apartments can be accessed via 6 entrances at street level. Half the apartments has windows to the market, these windows are triple glazed to avoid sound or smell nuisance. There is a broad choice of apartment types, from free layout loft apartments to duplex with multiple bedrooms. The properties vary from 80 to 300 m². The penthouses have their entrances on the tenth floor and inside stairs and room for an elevator to the eleventh floor, in this way the arch of Markthal could be realised without any elevator boxes on the roof. Markthal offers a rich diversity of cuisines, cultures and businesses. It’s a place where one can discover new concepts, and which offers great sales spaces. Not for nothing did the business owners opt for Markthal to sell their products. Koppert Cress produces cress and young plants (so called Micro-Vegetables). They are based in Westland, the vegetable garden of Rotterdam. As a wholesaler, their products are currently not sold directly to consumers but this will change soon with the opening of their market stall in Markthal, in collaboration with TomatoWorld and the Best Fresh Group. Owner Rob Baan:” Was their another choice? !” When Markthal approached Koppert Cress, they didn’t have to think long. Even though the Netherlands are a relatively small market for them, Markthal is very important for Rob and his company. “I am pretty chauvinistic and think that we can be proud of what we do. We are still good at horticulture!” Rotterdam was a logic choice for Koppert Cress. “The Netherlands were one of the first countries in the world where the majority of the people live in cities. You have to feed this city. Urban Farming initiatives, well, I find them very charming. But Westland is the vegetable garden of Rotterdam. The city has forgotten this a bit, and so have we. And there are two main ports that meet each other. Our worlds belong together. And what’s more is that through Markthal I have rediscovered the city. There are so many surprising things happening, in architecture, but also in the culinary field.